The Sentinel-5 Precursor (Sentinel-5P or S5P) satellite mission is one of the European Space Agency's (ESA) new mission family - Sentinels, and it is a joint initiative between the Kingdom of Netherlands and the ESA. The sole payload on Sentinel-5P is the TROPspheric Monitoring Instrument (TROPOMI), which is a nadir-viewing 108 degree Field-of-View push-broom grating hyperspectral spectrometer, covering the wavelength of ultraviolet-visible (UV-VIS, 270nm to 495nm), near infrared (NIR, 675nm to 775nm), and shortwave infrared (SWIR, 2305nm-2385nm). 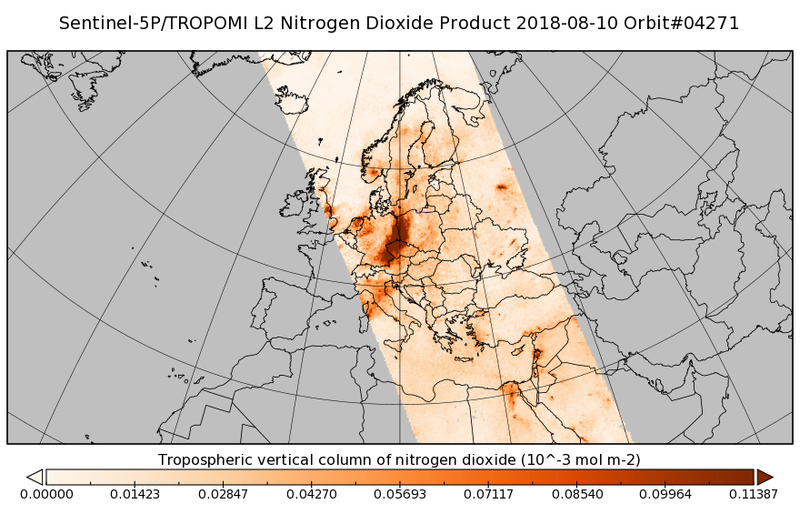 Sentinel-5P is the first of the Atmospheric Composition Sentinels and is expected to provide measurements of ozone, NO2, SO2, CH4, CO, formaldehyde, aerosols and cloud at high spatial, temporal and spectral resolutions. The TROPOMI retrieval of total and tropospheric NO2, is based on the DOMINO approach, a DOAS retrieval, a pre-calculated air-mass factor (AMF) look-up table, and a data assimilation/chemistry transport model for the separation of the stratospheric and tropospheric contributions to the NO2 column. It also include many retrieval developments of the European Quality Assurance for Essential Climate Variables (QA4ECV) project. Copernicus Sentinel No campaigns listed. No dates provided.